My brother Chris and I participated for the second time in the Belwood Pike Tournament, hosted as a fundraiser by the Belwood Lions Club. Last year was an epic failure for us, as we fished for 17 hours and caught only one fish TOTAL, a tiny pike. This year we had renewed hope, with better weather and a new Princecraft Boat to fish from. We had also been out on Belwood a couple weeks before and had some luck. Day 1 we were on the water just after 7:30 with beautiful weather and coffee in town. We fired up the mercury and headed to headquarters to check in. The conditions were fine, stable weather, not too hot, a bit too sunny, but no complaint. Should have been perfect right? Day one left us with deja vu as we fished the better part of the day and were skunked. We enjoyed beautiful weather and had a great lunch in Belwood, but small solace for the lack of fish! We can’t blame anything but ourselves. As we were checking in a pair of anglers were entering a 27inch fish which was at the time the largest entry. The previous year a 28 won the tourney, but we felt we could beat that. After our nice lunch in Belwood a dose of reality set in though as we learned a participant had entered a 40.25 inch fish. That’s a huge fish by any standards, and likely a lake record. We headed home discouraged by our fishing, pleased with the overall day, and knowing there was zero chance of winning the tourney we switched to just wanting to boat some fish! 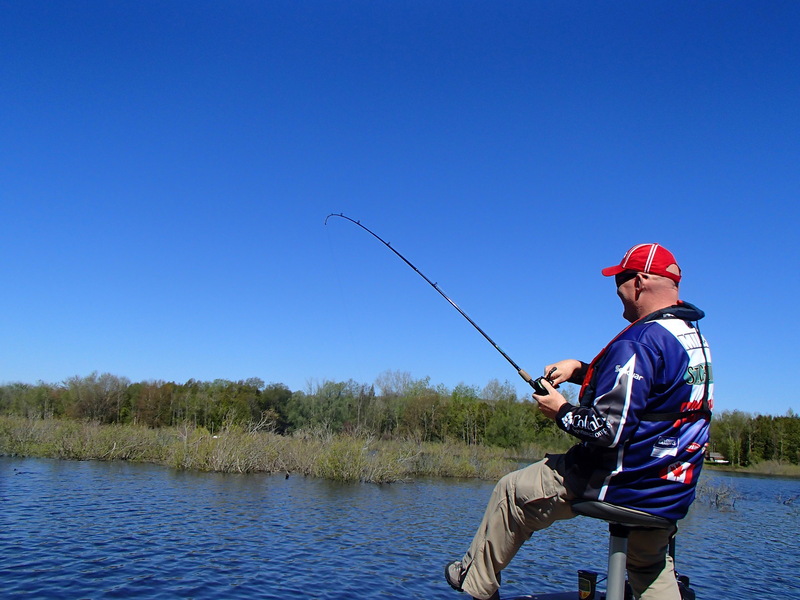 The second day we moved to some new locations on the lake, and fished flooded brush areas, hoping the warmer water and the deep cover would be holding fish. 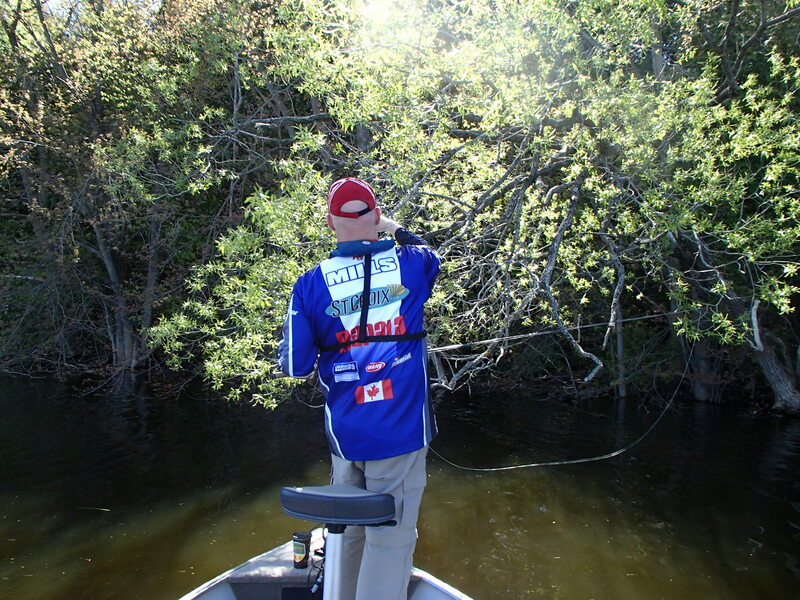 It wasn’t long before Chris called out the key “fish on” statement and we had a small mouth bass in the boat. We kept working similar areas based on this success, and over the course of a few hours we boated 4 small pike and 3 small mouth bass. While nothing as exciting as we hoped for, that was a far better result than we had experience prior. Belwood can be a tough lake to fish. With the current, fluctuating water levels, changes in water quality, limited structure, the locals for sure have an edge. We enjoyed our day, and we may be back again next year. We’ll have to let the sting of this years failure wear off. Good news though was the boat performed great, and we felt fabulous in the new rig. We were able to try out some new gear, and we did not lose a single lure! That’s a success in itself. Of course, if you look at this last picture we had to go into the deep stuff to retrieve a few of our more ambitious casts. 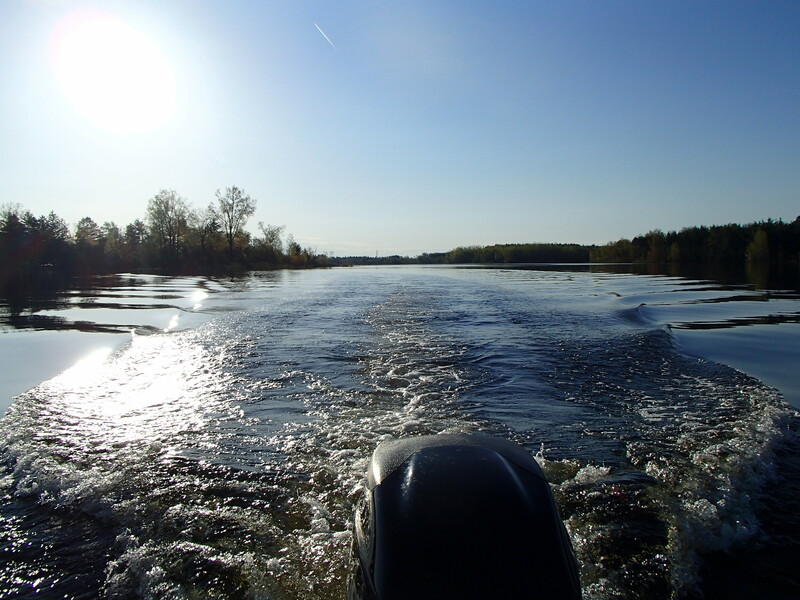 This entry was posted in Fishing, General, Lakes and tagged amateur, belwood lake, belwood lions pike derby, fishing, lures, pike, Rapala, Scatter Rap, St. Croix, trolling. Bookmark the permalink.